The train journey from Monza is a catalogue of flat fat prosperous towns. The railway comes out of Lombardy across the might Po river, broad and grey-green and awash with willows and poplars; the first town on the other side is Piacenza. A line of plump comfortable redbrick towns follow: Fidenza, Parma, Reggio, Modena, Bologna. The smell of pigs around Modena, turns out, not legendary. At Bologna the flatness begins to ease, the hills begin, and then it's Appenine all the way to Florence, and then the rolling waves of grain to Arezzo, and the Oh! the profile of Orvieto, high above the valley residing on its great tufa cushion, and then you are at Orte, and home. Well, I am, anyway. This is the Tuscia, which is to say the quiet farms, unexpected open cliffs, miniature torrents, and the beech and chestnut forests to the North of Rome. The Monti Cimini rise dark out of the rolling countryside: Poggio Nibbio, Monte Fogliano, Monte Venere, la Palanzana. At their heart is Lago di Vico, a cool shadowy lake, deep as history, unforgiving of careless swimmers. This is Etruscan country; the Romans, when they were contructing the via Cassia to Florence, took one look at the Cimini, and built a detour. A strange world of strange words written in stone two thousand years previously. Vicino Orsini was clearly taken with their mastery of water and stone, of their love of life and beauty, their mysterious beliefs and their fading away, an aesthetic slightly out of key, unable or unwilling to resist the tide of Roman taste. 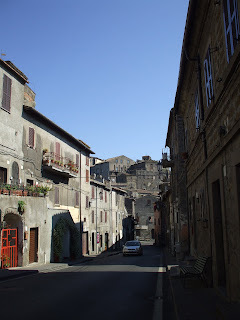 The Tuscia is Etruscan, but it is not all the same. on the slopes of the Monti Cimini there is Vignanello with its wines and chestnuts, celebrated from as far back as the 4th century AD; there's San Martino the 16th century model village, and of course Bagnaia, more on that place another time. But the queen of towns in the Cimini, if you pay attention to the guide books, is Soriano. I've never liked it, it looks fine on a postcard, but when you get closer you discover that its fairy-tale 13th century castle has been (ab)used as a maximum security prison up until the mid 1990's, and is still in desperate need of repair. It's something of a metaphor for all these towns, arid, crooked narrow streets clogged with cars and heavy with hard faces and over-curious eyes, and everywhere, walls, walls, walls. 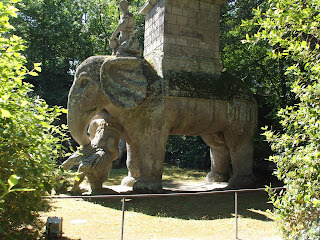 Bomarzo is like that. The people of Bomarzo have a reputation for being closed, even thick as the walls of the houses here, my travelling companion commented. Perhaps it's the nature of the place, all these houses thrown up against each other, like bodies found after a fire, all trying to escape from something - the briganti on the highway, passing battallions of mercenaries, the bears in the forest. Above Bomarzo, the palace of the Orsini, one of many Orsini palaces in the Tuscia, this is their stamping ground since, well, the invention of surnames. 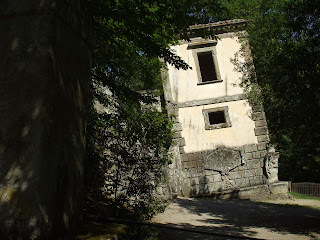 Under the sheltering or bullying shadow of the Orsini palace, not beautiful or particularly well proportioned, simply endlessly refashioned out of the living rock of the older houses, the family DNA , the town piles and tumbles along the ridge of the hill. But in the valley, ah, in the valley, other forces are at work. In a time when men finished college at 14, Vicino Orsini had to grow up faster than most. 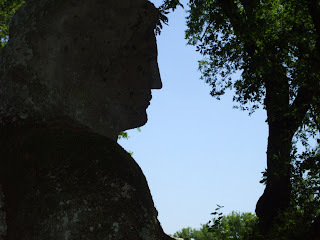 He was born into a powerful family, but his early adulthood was no walk in the park; he had to fight for Bomarzo, his own miniature kingdom; through the papal courts, at the age of 19. Cardinal Alessandro Farnese helped him. More fighting followed. Vicino - it means near, and neighbour, in Italian. His given name was PierFrancesco, the origins of the nickname I cannot tell. He was a reader, and, even if not on the scale of Federigo di Montefeltro, a lover of books: he would have had access to the library at Caprarola, and certainly would have had his own copy of the major works like the Divina Comedia, the Roman de la Rose, the pastoral poems of Poliziano and so many others, and the Classics of Latin - things of practical interest like Caesar's Gallic Wars and Pliny's letters, describing in vivid and much-copied detail the gardens of his villas in Tuscany and in the hills of Rome. There were items of thoughtful and fantastic Greek literature which during this time was gradually coming to the surface, Ovid's Metamorphosis first and foremost, an trailing tail of transformations and transgression. Pegasus, his hoof still striking the rocks of Mount Helicon and creating a gush of poetry in the world, is one of the first statues you encounter in the garden. 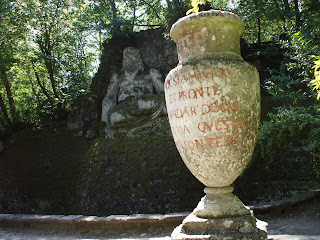 Everywhere inscriptions in red letters, red like the red stain on the necropoli of the Etruscans; notes and mottoes, some proudly explicit, many others veiled in the secret meaning and mythology of the Bomarzo Orsinis. On top of these, he would have read Orlando Furioso, written just 50 years before his birth, the 'corrective' Gerusalemme Liberata, both so appropriate for Vicino's career. Like the characters in those poems, he became a soldier, which means a working man, a condottiero one of the many Italian soldiers for hire, charging around the peninsular and bits of France and Spain, from Perpignan to the Pas de Calais, in the mix in exchange for a fee or a share in the spoils. He became close to the playwright, poet and translator of Virgil, Annibale Caro, over in Montefiascone. He became a husband; in an age where marriages had everything to do with politics and little or nothing with love, he found both, at 21, with Alessandro Farnese's cousin Giulia. He saw things. The value of friendship, the ferocity of war, the pointlessness of loss. 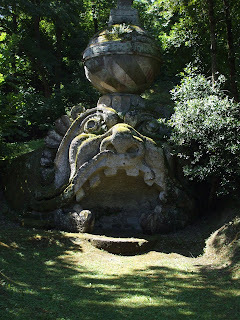 Somewhere in all this, he began his garden at Bomarzo. 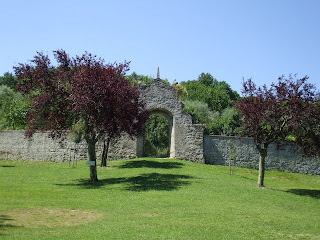 The mid 1500's, in Lazio, is the Age of the Garden. Villa Lante and Villa d'Este, The houses of the Medici and Alessandro Farnese's own masterpiece at Caprarola, on the other side of the Cimini mountains, were all taking shape. Along lines. With emphasis on proportion, on technicalities like water spouts and perspactive. Tight formal spaces for dignified walking and showing off giving way, but only just, to areas of more abandon, hideaways for the jetset to flirt and play away from prying eyes. Everyone thinking of Pliny's villa, or rather his letters describing it, and showing off the remains they dug up as they built their new versions of the villa. 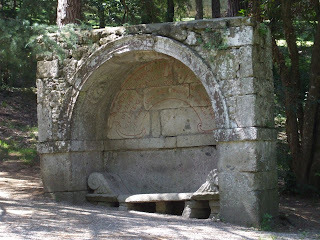 In the Tuscia, Etruscan sarcophaghi, eyed with suspicion in the Middle Ages, suddenly become in vogue, as benches and ornaments and horse troughs. of At Villa d'Este and at Hadrian's Villa, which had recently been rediscovered just to the South of Rome, the souvenirs and allegories are on show like coffee-table trophies, laid out to impress and cow visitors. Well, maybe I will tell you more about that another time. 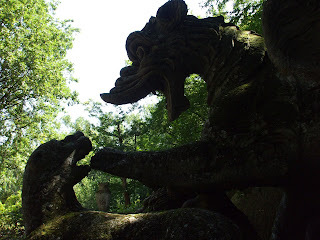 Bomarzo is not like that. There used to be a formal garden here too, you know; like Villa Lante or Villa Aldobrandini, one of those not quite knot gardens, with low hedges of box or privet, lemon trees in containers, gravel paths. None of those gaudy colonial interlopers, begonias that you see today, though. At best a spot of coloured glass on the ground among the gilly flowers and marigolds. But that was all lost hundreds of years ago, and now lies under the sweeping lawns of the picnic area. The Sacred Wood, the carved, careless wilderness remains. 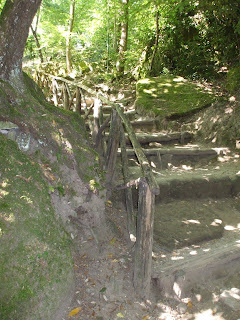 Vicino made a place in the wood, 'sol per sfogar il cuor' ... simply to let one's heart out. A forest left to itself, with figures carved out of the living rock, much as the Etruscans had done two thousand years before. 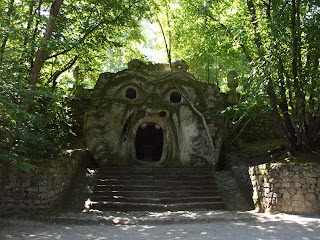 The the oversight for the park 'of monsters' as it is also known, was in the hands of Pirro Ligorio. Not a plantsman, but a good eye for a valley, and an architect, really, before the age of the fancy corner office. The monsters are eveywhere, dragons and lions, dogs and deformed giants and demons, even the heroic Orlando is in full fury, ripping the Orco in two. Hard to tell, though if the monsters are snarling or laughing, as if the mood is eternally changeable, open to the interpretations of firelight and shadow and afternoon sunlight. And torchlight. Ligorio certainly had a lot of input on this garden, taking charge of the daily operations, the practical details and the essential task of putting together a team and having his trusted workmen follow the plans laid out, instead of taking the line of least resistence as workmen always do, this certainly was an important element in the creation of the garden. But this is Vicino's garden, and Giulia's too. The first most beautiful thing is the sound of the wood. The wind in the leaves, and the rustling river, a siverblack scar running down the rocky face of the valley. The sound took me by surprise, and the size of the statues too. They are perfectly proportioned to surprise and delight, to draw one in close enough to look carefully and think about the meaning behind each; the tortoise with a tower on its back, the war-elephant devouring a man, the open tomb, the Three Graces traced into the cliff. A pleasure park, then, full of the souvenirs of travel - travel through books and through Europe, through the loss of friends, like Orazio Farnese, and freedom too: Vicino was locked up by the Germans for two years after a battle in Northern France. The path of a personal philosophy born among the Cimini hills, shaped by faraway places, deep and delightfully unashamed brought into existence a garden of delights and terror so closely married that it becomes impossible to tell them apart, like the woods themselves, moving from shadow to light with the changing breeze of as one's imagination. For two years Vicino's fate lay in the balance. He was imprisoned in far-off Germany, and there was no knowing if he would return. Giulia was left to watch over her husbands interests, guarding them from the greedy eyes of his brothers and half-brothers. Her legacy she summed up in a building, an original creation, the casa pendente. It is not a natural disaster, like the tower of Pisa, the house is built on a crooked rock, symbol of the circumstances in which she found herself. Out of the questionable materia prima, she manages to bring forth a house: una casa, un casato worthy of her husband. Vicino went on adding to the garden after her loss, but the accent changes. 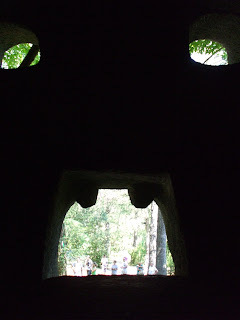 From the under the canopy of trees the path among the sculptures winds uphill and out onto a sunny lawn to a monument at odds with the rough and riotous pagan rocks below. 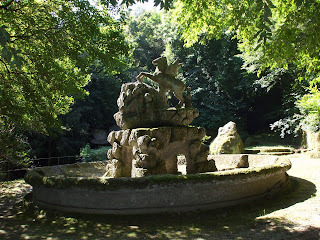 The lawn exposes the secret of Bomarzo: that the sacred wood is only a pretending to be wild. The real wilderness is aldilà over there, beyond the gate, real, banal, unmagical, plebean. 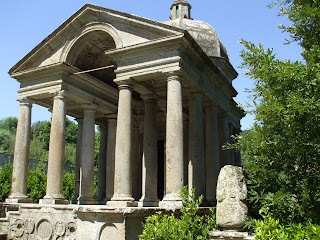 In sight of the edge of the world of magic, with cerberus in the hollow at its side, like the sleeping woman and her dog further down the hill, Vicino built the Temple to Divine Love, half Greek and half Roman in design, in memory of his wife. But when one reaches the portico, one discovers she is not here. 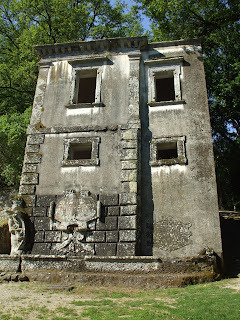 Her bones are in the family vault, in Bomarzo, with everyone else. The temple is empty, she is gone, Divine Love is an open space, its walls are beautifully useless and cannot contain her, and love is nothing that can be put in man-made walls, nor can all the magic of the rocks nor all the wisdom and the philosophy the honour and the power of the garden, none of its glorious ambiguity is able to transform this last and greatest certainty.